See the Specification Sheets in the Documentation Tab for other versions of the Model 5100. Typical Operating Range 0.25 - 60 lb/MMscf / 4 - 1900 mg/m3 (5 to 2500 ppmv). Other ranges available. Speed of Response <2 second photometric response. Total system response is dependent on sample flow rate. 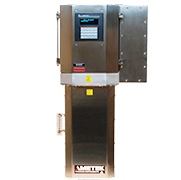 AMETEK Process Instruments TDLAS products utilize laser devices with safety classifications of Class 1 and Class 3 b.